On January 28, San Diego's rock station Rock 105.3 conducted an interview with METALLICA bassist Robert Trujillo. You can now listen to the chat below. Although METALLICA expects to start working on its 10th studio album soon, drummer Lars Ulrich has all but ruled out any chance of the disc arriving in 2014. At the Grammy Awards last Sunday (January 25), Ulrich was first asked whether METALLICA plans to make another movie. He replied, "One at a time. The next thing we have to give birth to is another record, so that's the focus for '14 and '15." Asked when fans might get to hear the new disc, Ulrich added, "I would say definitely not before '15." METALLICA's last all-new album, "Death Magnetic", came out in September 2008. 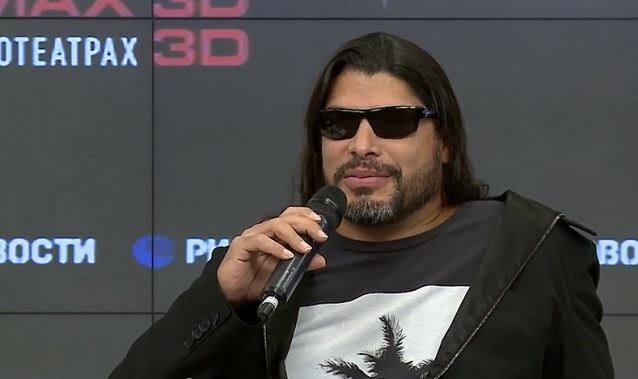 Ulrich said that making the "Through The Never" movie re-energized METALLICA's creativity, explaining, "[Working on the film] gave us a chance to experience a whole other way of being creative and having a creative outlet. We were very inspired by making that [movie], and now we're energized to make a record. The film was fun, but it's all about the next record." METALLICA will hit the European festival circuit this summer, with the band's set lists comprised of requests made online by fans attending each date. One slot at each night's show will be reserved for a new tune.